So … my week started with my team getting trashed … boo hiss! Then I realised after the game, that the yoke of my Flax sweater looked small because … doh … I didn’t change to larger needles after doing the neck band!!! 😦 That means starting over and at this point, my timeline to finish it as an OWL for the HPKCHC competition is not going to be met. No worries though … although that baby’s on timeout, I’m even more determined to finish it. Then on top of all that, I go to work yesterday to hear that my job has lost all its major funding contracts, staff is going to have to be let go or mercifully, moved to other agencies. Adding to that stress, a position in my group (that has moved from 7 to 3 in the space of two and a half years) was slated to be on the chopping block. I’m not going to lie — it took a while for the meditative rhythm of knitting to get me to loosen my grip on the needles, to stop gritting my teeth, to lose the urge to cuss uncontrollably and to actually get back to the point of relaxing. Once I got myself together, I was able to pray, receive heavenly Help which allowed me to start breathing easier. 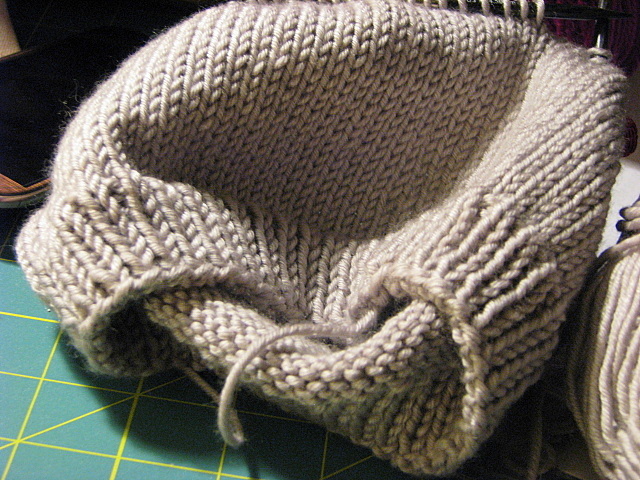 When I looked down … the hat was almost at the point of decreases! LOLOL! Now that’s my kind of therapy! There’s a lot to be done in the next two weeks and I’m going to have to push myself and my team hard to accomplish these goals. But in the mean time, while my Flax sweater is on time-out, I have to make some serious professional decisions while keeping calm and knitting. Even if it’s just a hat! ‘All is Grace’ Nicky and while I know this time is so very stressful in the end I just know HE has something wonderful in store for you. Keep praying, HE is listening. I’m glad that you have your knitting to help calm you and if you need to say a cuss word or two I don’t think anyone would fault you on bit! That hat is looking really cool. The yarn knits up nice & smooth. Sorry about the job drama. I’ve been hearing a lot of bad news lately about folks & jobs. One of my friend’s husband was fired from his job a couple months ago & my friend, “Jack” is battling management over shenanigans at my place. I’m at the point now if I could turn knitting & sewing into a decent living, I’d consider switching careers. Girl … you and me both. Right now, with my growing garden, if I could do something in agriculture, I’d switch to that. Yes indeed for the therapeutic value of knitting. People underestimate the stress reduction value that hobbies brings to a person’s life despite research. Knitting’s right up there as a top de-stressor and I’m glad for some skill in it. Unfortunately, the work situation is going to get worse but trusting in God is what I’m being reminded to do and for once I think I should obey. Awful news! I am so glad that knitting was able to help you get into the place where you could find grace and diffuse that mood. ((hugs)). I hope that in these troubled times your path forward becomes more clear. Thanks love. I’m praying for guidance, I’m trying to enjoy my work team since I don’t know when we’re going to be disbanded and I’m trying to take everything in stride. Sorry to read about your situation at work. Glad that you are holding your head high and following the words of E Zimmerman: knit on, with confidence and hope through all crises. Hoping that this situation starts to improve. Thank you so much Sam. Love the “Zimmermanian” reference. Yes indeed … I’ll continue to knit with confidence through this crisis. The situation is going to get worse before it gets better but I’m trusting God to work things out for me.